When accidents happen and dangerous situations come into play, it is important to have your emergency contact numbers easily accessible. This emergency contact list template allows you to store all of your emergency contacts in one place, so that you have all of those important numbers ready when you need them. 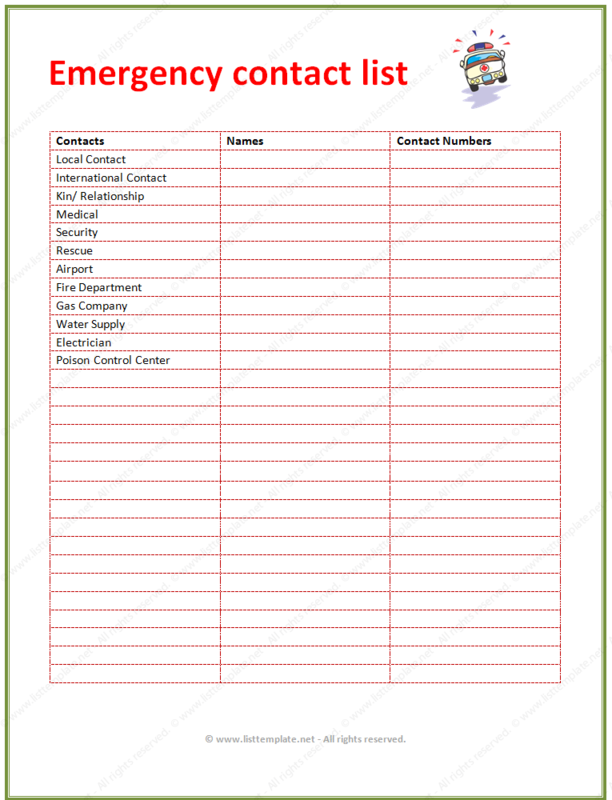 This contact list template includes space for you to track the names and phone numbers of a local contact, medical and rescue contacts, the gas company, and more. This template helps you create a contact list that includes all of the numbers that will be important to you in an emergency situation, and it helps you to make that list both simple and professional. This template was created in Microsoft Word®, and it is easy to use. You can customize this template to fit your needs, and you can use it to store all of the numbers that you might need in a bad situation.